Hullo, all you marvellously talented gnawable brains. I've stalked through here and several other pixel communities the last few years, slowly - ever, ever so slowly - studying every little bit of work that I can, saving and sorting oh so many pixelations into my little research folders, desperate to learn and hopefully incapable of giving up. I long believed I couldn't ever draw, but after discovering pixel art and putting in a good deal of effort I discovered that if I give anything long enough, I can do it. Give it a million years and I might even actually do it well. It has become increasingly clear that my progress may be so slow because I haven't sought out guidance and critiques from those in the know. Frightened of being told to abandon it altogether for having no hope, and some such nonsense. In short, I'm boggled and feeling at my wits end tonight. I would love any tips or secrets - the ones you're willing to share, anyway - on how to better draw the foliage of trees. Especially more time efficient methods. I've spent ages trying to find information on how to draw trees and have hopefully already read everything on this forum regarding it. If I may have missed something, feel free to link. Going for another search after posting this. 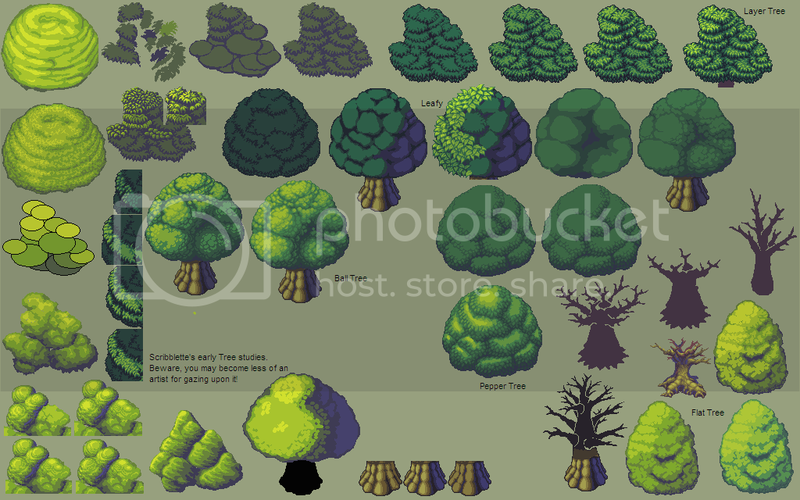 Below you'll see a little WIP sheet with my 'experimental study of trees in pixel form'. Or something. None of the trees are finished pieces, as I felt all of them failed on some fundamental level - I know something's wrong beyond what I mention below, but I don't know WHAT. That's why I'm here. 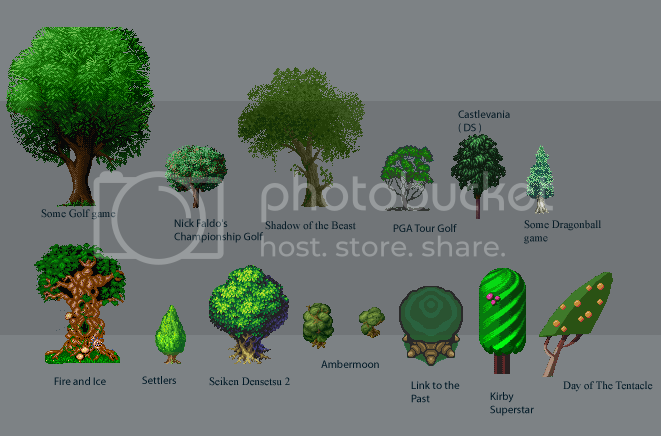 Reference material was mostly trees from this forum thread example sheet, work by HulioG (on this forum), a trunk outlined from work by Zyndicate, and one from RMXP. I'm looking to design a tree you'd see many of in a game map, so am not looking to make it too asymmetrical. - Ignore the very early attempts on the far left and bottom right, please! - The base of the trunks was crudely shaded simply to give me some idea of depth - I didn't think they required primary focus just yet. I figured not ALL beautiful pixelled trees have branches visible - or show very little. I did try to get the shapes and structures down though. 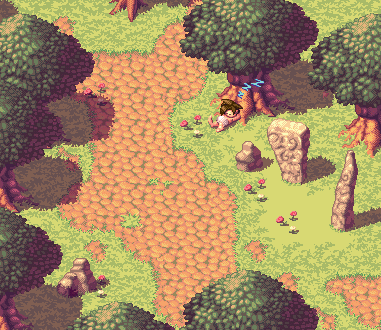 Foliage etc has not been intentionally anti-aliased yet as I was trying to get an understanding of form and so forth before fully polishing off anything. - Layer Tree on the top right has perspective issues, I think - I somehow made each 'layer' of leaves look exactly like that - layers. Instead of bunches of leaves in a more, uh, globular fashion. - Leafy Tree involved creating several leaves of similar sizes and pasting them one by one to create bundles. It seemed not the most sensible method to 'learn to draw' by for the time involved, but providing I manage to shade it properly, it might look most like traditional pixel art and be a wiser path to follow? I thought as I was trying to study form, I would focus on ones I'd draw completely. - Ball Tree was the easiest and I think may have been the best attempt. However, I don't know how to translate that into having leaves, rather than being blobs of colour. I haven't yet figured out how to paint leaves in. Also the perspective wound up too flat. I feel the far right version (before highlights) looked better. I have since been trying to google how to shade flat top mushroom shaped discs for being similar but haven't found anything... they're a bit odd, something about two main highlights before the terminator? - Pepper Tree confused me. Until it came to the last three lighter shades, it seemed to be coming along quite well. I haven't completed the last few shades as they were simply more of the same 'create leaves clustered and scattering towards the next shade' and I realized that wasn't working. I'm not sure if the issue is my color palette. I have tried several. I'm also partly colour blind. I also find the lighting to be confusing to work out. It's to the top left, behind and above the trees. Does anyone think I was on the right track with any of my attempts? Any advice on a general direction to follow would be much appreciated. I apologize for not having written this earlier in the day when I may have been a tad more coherent and less scatterbrained. I've let trees keep me from dinner and it's now near 1am... eep. Re: WIP - the trees! Augh! Save me from the trees! I think you're going in the right direction. A little more contrast probably wouldn't hurt, but it's all a matter of the context. There's obviously no right approach, you can aim for realism or try to be very abstract and stylized, that all depends on what the rest of the graphics of the game look like. I once made this chart where I tried to put trees in order from the most realistic to the most abstract. I've never posted it before because I forgot the names of some of the games these trees were taken from. Thanks, Dr D! I'll be glad if my struggles can help anyone - just don't read too much thought into each pixel stroke, as I tend to do with everything I examine. If you want a well done Leafy tree, check out Final Redemption Fruit, a little down the page - if you log in there's a GIF that shows the WIP stages, but unfortunately it doesn't demonstrate whether he cuts and pastes leaves, draws them all together or even how long it takes to know if it's efficient in any way. JJ Naas, I rather like that Golf game tree, have saved it to pick apart in the morning. Reminds me that I haven't dithered my trees there at all yet, and perhaps that could be what fills in the bulk between leaf layers, rather than a half dozen more layers of leaves. As per style, I was hoping for a somewhat more realistic approach to trees, but I'd rather go with something that both looks good and can be done time efficiently - a little 'cute' doesn't hurt too much. I'd much rather learn how to draw it all. I may need to do something about my monitor - two laptops, two PCs (one LCD, one CRT) and none of them are color calibrated, and I'm left wondering whether everyone else uses too much contrast, or I just use too little! I use more than some but less than others... so I don't know yet! I just try several palettes. HulioG's '08 piece, though I should try his '09 style. I haven't seen that particular Pokemon mentioned here yet (may have missed it) and must point out that if anyone out there is struggling with cliffs, they've got a whole variety of beautiful cliffs in screenshots on the nintendic website well worth the study. The Aveyond series have a couple especially good Conifer-type trees thrown in amidst the rest, if you can spot them. Couldn't find any non-resized-jpegs on the spur of the moment to include. 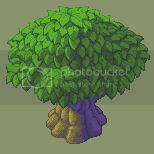 Doing realistic isometric pixel trees as game hart is a little bit difficult because first of all if they were meant to be really realistic, like this, then you wouldn't be albe to see individual leaves or almost any of the trunk (from a isometric perspective). However, using bonsai trees as a reference for game art purposes might be more helpful than using photos of real trees. With bonsai trees you get the cuteness, simpleness, individual leaves and often an isometric angle as well. Heh, I thought of that too I've been studying and drawing bonsai trees the last few weeks unfortunately most bonsai trees I've found are tailored for 'character' and are thus VERY asymmetrical. Worse yet, they tend to be flat-on view, and I'm trying to get the isometric and 3/4 view. The other thing is most bonsai trees I've found are taken with lighting from the front or from several different angles, making light + leaf study harder (at least in my mind) to do on a single tree. I realize that near-perfect is as close as I'm going to get though - that tree you linked was the best I saw. If you see any better ones out there, please do link! My brain hurts from too much bonsai googling. My first attempt vaguely used that as a model - I'll have to give it another go, especially since I had no clue whatsoever at that point, and I might have more luck now. I think trees are just one of those things you have to play with until you get something you like, because there are SO many ways to even approach just the basic shape. Sorry for the delay in updating. Easter + half attempts that didn't pan out, etc. The thread isn't about which approach is 'right', but hopefully will be a 'how to' for strugglers on some approaches which are (a) most aethestically pleasing and (b) most time efficient. Or deconstructions of some of the fantastic trees out there. I'm not claiming to be a fantastic artist or authority on what works best - I'm just exploring. This post is an experiment with the 'leafy' style that Dr D liked. As far as I can tell, there are three basic approaches to constructing a tree leaf by leaf. 1. Create a leaf cluster, copy and paste it repeatedly until canopy is complete, then shade accordingly. Quickest, but runs the risk of looking 'flat'. 2. Create several leaves, copy and paste them in layers encircling the tree. Runs the risk of looking like a circular stack of leaves. 3. Create several leaves, copy and paste them into several layered clusters, then shade. Slowest, and can lose your sense of depth without a reference. I've not seen examples of 1 & 2 that I actually aspire to, so I tried #3 with larger leaves in the hopes of saving time. Using 3 colours, I drew six base leaves which were then flipped or rotated. The lighting is not perfect, the tree is not anti-aliased and I shaded in a wide brush in broad strokes etc. Ignore the trunk! Shading involved using another dark color on a partially transparent layer - this was a BAD IDEA. I hoped to merge layers and adjust the palette for the three colours impacted, but it didn't work at all (especially not for a planned hue shift as seen on trunk. Silly me.) Would have been better to shade each leaf appropriately. Saved for possibly doing that in the future. At least it doesn't look as flat as unshaded. Unfortunately it wound up too much like a #2, likely because I didn't use a trunk or branches to help direct structure or to be exposed between leaves. It would have done better with more slight variations on some of those leaves, and probably best not to have any flat-forward facing leaves. It is also very easy to lose your sense of depth when it comes time to shade. All up, it seems this method may be less time efficient than just drawing the entire thing outright? I'll re-try 'ball tree' next as I think it was quickest. Will try to get the highlights right this time, and I'll see if I can distinguish the leaves without making it an ugly mess. I'd still like to create something like Zyndicate's tree - it was used as a structure reference for leaf placement above. Does anyone have any thoughts on how Elk achieved that square leaf effect in his example here? Was it simply done with a square paint brush, or a scattering tool to help get the density right? Any input welcome, as always. Edit: Is it worth cross posting to PixelJoint forums for input as well, or is it mostly the same people on both forums? Sounds like your a Photoshop user like me. You may not realize that a lot of guys around here cringe at the mention filters and advanced brushes, etc. Lotta purists here, which isn't a bad thing. I could be wrong, but guessing from my time spent here - less merit will be awarded to pixel art done with advanced image editing techniques, therefore less crit assistance due to wained interest. I, however am all about expediency and 100% approve all yer efforts, saving time is important. I love this thread so far. Never seen "trees" themselves deconstructed. I hope you find that perfect tree producing recipé, I'm watchin' and waitin'. I have yet to attempt any trees so I can't really help you at this time. Not a big fan of Elk's blobby tree, I can imagine a number of ways in Photoshop to produce that type of texturing. I do love the ensemble one, though. And in comparing it to yours I see that a perspective trick is used that you may've overlooked - he's scaling down the leaves as they get farther away from the viewpoint. His tree consists of branches supporting "spheres" of leaves so the leves in the middle of each sphere are the largest. His applied diminishing perspective is exaggerated to acheive the effect and it's nice. Highlights also falloff as the eye rounds the sphere. Did you notice that? This is something your copying and pasting method will not help you do, unless you create a set at all scales, which is starting to seem complicated but still feasible. Btw, I like youir current result's basic lines. It's simple and has character. The bulbous protrusion in the front saves it from looking like a boring symmetrical umbrella shape, restoring some naturally-shaped appeal/visual interest. Ensemble tree - not sure which you mean. The '08 one by HulioG? I'm meaning to give that style another shot too. When I tried painting trees in their entirety I did neglect the size of leaves as they move away, so thank you very much for pointing that out. I think if I'd made a second set of smaller leaves the leaf by leaf one would've been much better, as I lost a lot of the curves I intended for as per Zyndicate's piece. With smaller leaves I could've structured softer protusions for more character - therés a hint of what I meant for on the lower left corner.